250 mg of powerful nutrients in every serving! 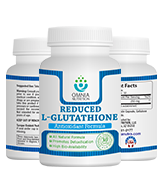 Find out why thousands of people use L-Glutathione for better health! 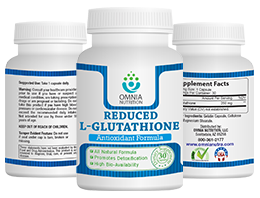 Supplementing with Reduced L-Glutathione is vital whenever there is an increased need for antioxidant protection and intestinal support of detoxification. 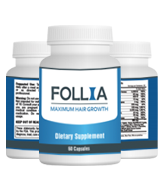 Add Follia to your daily routine to help stop hair loss, stimulate hair follicles and grow back lost hair safely and naturally. Welcome to Omnia Nutrition, the leading source of high-quality supplements. At Omnia Nutrition, we have just one goal: To bring top-quality supplements to market containing the latest ingredients proven by science. All Omnia Nutrition supplements are formulated in our state-of-the-art licensed facility from the highest-quality natural ingredients. Using a holistic approach, our ingredients include patented herbal extracts from all over the globe, and we work closely with raw material suppliers to ensure our stringent quality control standards are met at every step of the development process, from farm to shelf. Unlike some products that contain dangerous stimulants, prescription medications, or banned compounds that can cause further health problems, all of our approved ingredients are manufactured under strict GMP quality standards, and comply with the highest FDA standards, from all-natural ingredients. From our advanced Reduced L-Glutathione formula to our hair loss supplement, the ingredients in Omnia Nutrition products have received wide-spread media attention. When you order from Omnia Nutrition, you are getting the actual pure ingredients, from the purest sources. Don't be fooled by imitations or sub-standard generics that claim to have the same ingredients and effects of true Omnia Nutrition products. All our product lines are based on proven science and backed by our 60-Day Money Back Guarantee of Satisfaction.